The XXIII Olympic Winter Games begins today in PyeongChang. I learned on a recent visit that Kays Curling in Mauchline have provided the competition stones to the Winter Olympic Games since 1998. So congratulations! to Kays on their 20th anniversary of being the sole supplier of Ailsa Craig granite stones manufactured in Mauchline and used by all the competitors from around the world. Good luck to the all-Scots men's and women's Curling teams representing Great Britain when they begin their competition on Wednesday 14th February. Today marks 100 years since the Representation of the People Act which gave some women the right to vote and extended the vote to men over the age of 21. Whether it’s chatting about the issues over a cup of tea, or engaging with one of the many exciting events as part of this year’s UK Parliament Week, there are countless opportunities for schools and community groups across Kilmarnock and Loudoun to get involved in this key anniversary. We all know that there is still more to do, and I look forward to working with people across Kilmarnock and Loudoun to ensure we create an even more equal society. It was a privilege to attend the Kilmarnock Academy Holocaust Memorial event on Monday 29 January. The background to this was the revelation that the multi-employer scheme operated for plumbers in Scotland and Northern Ireland, (SNIPEF) is having to advise some members that they owe hundreds of thousands of pounds and even over £1m due to the perceived debt or black hole in their pension fund. However, this is as much to do with changes in legislation to the 1995 Pension Act and how the debt is calculated. And the debt includes “orphan debt” – debts assigned to members who left the scheme prior to the last legislation change in 2005. As it stands several employers/individuals face financial ruin despite having responsibly tried to look after employees, and many live in fear of financial ruin and cannot change ownership or pass the business on for fear of triggering the debt. A plumbing company in my constituency with approximately 20 employees altogether closed before Christmas as a consequence of it being unsellable with the potential liability associated with it. So changes to the legislation are required before matters get worse across the country. Thank you to Linda Corbett, Energy Adviser from East Ayrshire Citizens Advice Bureau (CAB) for taking the time this morning to pop into my constituency office to explain the help and advice that CAB can offer. CAB energy advisers can provide a wide range of advice on energy issues including support to understand bills, help to make comparisons and find cheaper deals, complaints, escalation of complaints to the ombudsman, advice on options for debt and debt solutions including write off. 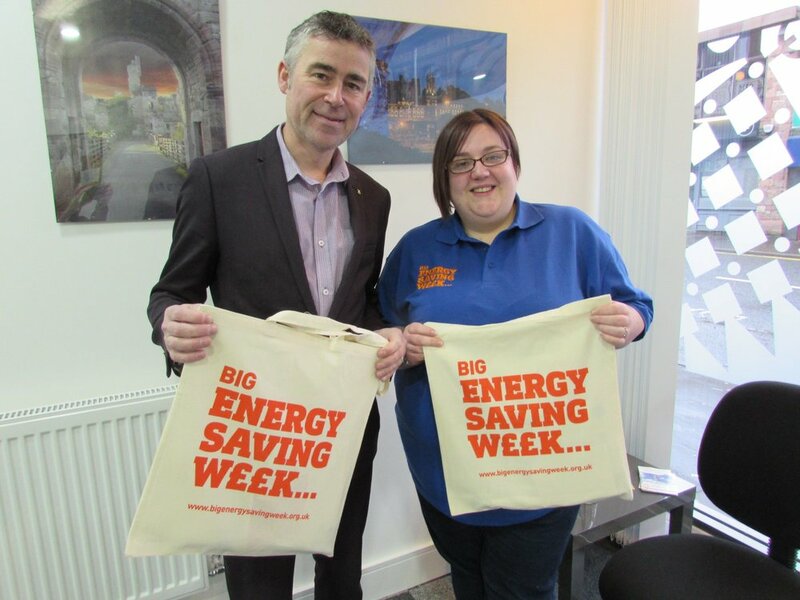 Linda and the CAB team will be delivering a week of events across the constituency to coincide with the 'Big Energy Savings Week' including a 'drop-in' advice stall in the Burns Mall Kilmarnock on Tuesday 23rd January and in the Asda store in Cumnock on Friday 26th January. See the attached poster or checkout East Ayrshire Citizens Advice Bureau's Facebook page for all the events next week. I attended the launch of the Open Doors UK, World Watch List 2018 report yesterday to hear first hand about worldwide suppression and persecution of Christians. Tolerance and freedom of belief for all would be the world a better place. I will be hosting a Public Meeting on behalf of the HELMS Action Group Ayrshire at the Park Suite, Kilmarnock on Thursday 18th January at 7.00pm. Like many readers, the year 2017 has flown past for myself. Clearly there was another general election this year, which was unexpected, unnecessary and unwanted. I was honoured to be re-elected and given the instability of the new Tory Government it remains to be seen if this parliamentary term will last the intended 5 year period. It is clear that the UK Government still does not have a real plan for Brexit. However, after 18 months and caving in on every demand, they have finally agreed the preliminary terms. So, phase 2 of the talks now begin. The aim is to have deals concluded by October 2018, in order to allow them to be ratified in time for the UK’s planned EU exit in March 2019, so in reality only 10 months to do the real hard negotiations. Government Ministers better make the best of the Christmas holidays as they will be busy thereafter! Sadly, too many people at this time of year are reliant on foodbanks. This is a combination of Tory welfare cuts, zero hours contracts, low wages and sometimes lack of full time jobs. We have to remember that when children are involved then daily life, including school work and learning is more difficult if you are hungry. I will certainly be making more donations to the foodbank collections and I would urge others to support these initiatives. It would be best if they were not required at all, but at the moment that is wishful thinking. My personal Christmas wish list is fairer transitional arrangements for women affected by the state pension age increases; EU negotiations that allows Scotland to stay in the single market and customs union, protecting jobs; the UK Government providing financial support for the Ayrshire Growth Deal; the UK Government loosening their purse strings to reverse the cuts to the Scottish budget and for the UK Government to confirm that powers that come from the EU will go directly to the Scottish Government as well as the equivalent budgets. I appreciate that I am somewhat optimistic with my list but even some movement would be good. The WASPI women deserve a decent Christmas present and I hope that the parliamentary arithmetic now means that something will happen. Here’s to a Merry Christmas 2017, a Happy New Year to all. Remember, for any last minute shopping…use the wonderful friendly local shops. Judging the entries for my annual Christmas E-Card Competition with local primary schools is always a very tough task. But this year the children surpassed themselves with their artistic endeavours and I really struggled to reach a decision. The overall winner was Lucy Daly from Fenwick Primary and you can see her design above. The runners-up were: Brad Dalziel from Park School; Andrew Bowman from Newmilns Primary and Caiomhe Welsh from St. Sophia’s and their designs are below. Thank you to all the children who submitted their designs – I really enjoyed looking at them all. My Constituency Office staff recently took part in a training session to become Dementia Friends. Dementia Friends is an Alzheimer Scotland initiative and anybody can become a Scottish Dementia Friend. It’s just about understanding a bit more about dementia and the small things you can do to help people with the condition. This could be helping someone find the right bus or being patient in a till queue if someone with dementia is taking longer to pay. Every action counts. Our session was delivered by East Ayrshire Dementia Advisor Helen Hollywood and you can find out more about upcoming local sessions here and more about Dementia Friends Scotland via their website. Ahead of Small Business Saturday tomorrow I decided to visit some of the independent shops and businesses in Mauchline and Galston. I know how difficult it can be for independent shops and small businesses to compete in a market that is increasingly dominated by the big players and online shopping. However, I also know that buying from a locally owned business means the money is much more likely to stay in our community and benefit our local economy. That is why I want to take the opportunity to encourage the public to shop local whenever they can and to try and help ensure our local businesses prosper. Thank you to all the Mauchline and Galston business owners who took the time to meet with me and discuss areas where I could lend my support as their MP. As the local MP I want to give my backing and support to the great work that small businesses deliver throughout the constituency. Indeed it is small businesses like these that are the lifeblood helping deliver strength and vitality into all our towns and villages – please give them your support whenever possible. Photos of the businesses I visited are below and I'll be posting updates about each visit on my social media over the day tomorrow. Supporting pause & reform of universal credit and Dr Philippa Whitford's Ten Minute Rule Bill at Westminster. I got the opportunity recently to take part in a static bike challenge organised by the Industry and Parliament Trust (IPT) and The Royal British Legion. 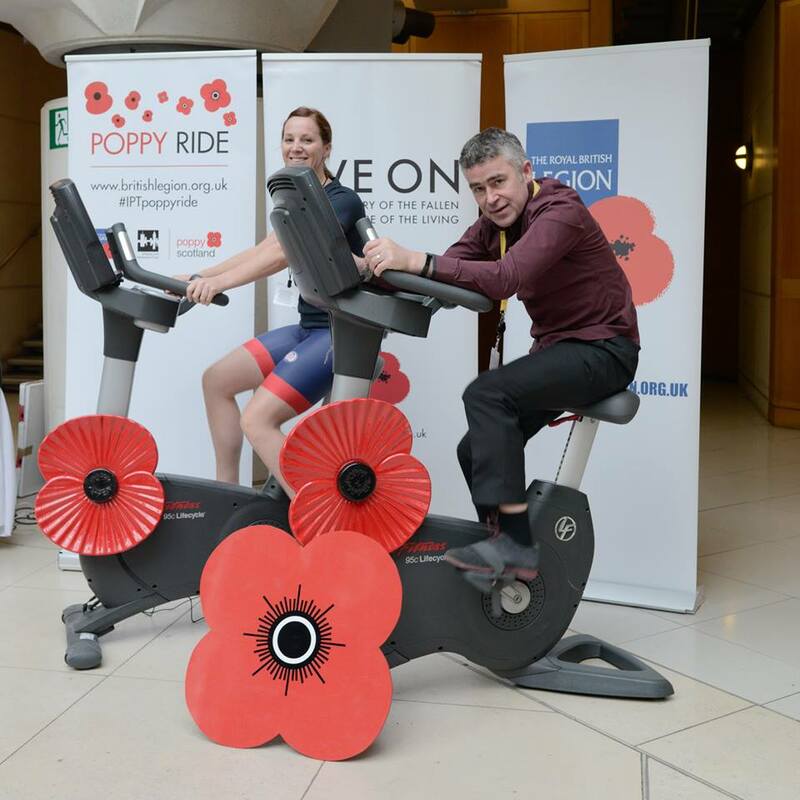 Over 90 Members of Parliament raced alongside serving members of The Armed Forces on an exercise bike to raise money for The Royal British Legion’s annual Poppy Appeal. The 12 hour bike ride was held in Portcullis House, Parliament and aimed to raise money for the Legion’s national Poppy Appeal. Representing the constituency of Kilmarnock and Loudoun I managed to cycle 3.06km in 5 minutes. The Royal British Legion and Poppy Scotland provide invaluable support to The Armed Forces community and I was pleased to have been able to support such a worthy cause. I am also looking forward to my visit later this week to the new Poppy Scotland Ayrshire centre that has recently opened in King Street in Kilmarnock. Offering one-to-one local contact, this centre offers specialist support and advice to veterans and their family members. (Telephone: 01563 598000 / email: kilmarnock@poppyscotland.org.uk). I’ve signed a motion in parliament to urge the UK to lead the fight against cruel cosmetics. Please join me in supporting Cruelty Free International’s campaign to end animal testing for cosmetics worldwide. It’s time to end this practice everywhere and forever. I was delighted to meet with Salena Begley, Partnership Manager of the charity Family Fund recently to find out more about how they can help families raising disabled or seriously ill children and young people. Along with Salena I invited Moira and Charlene to meet me at my office for a chat about some of the challenges for their own families. Both Moira and Charlene are mothers who have been helped by the support and guidance Family Fund have been able to provide. Family Fund has been around for over 40 years, originally part of the Joseph Rowntree Foundation, they have provided grants to over a million families over the years. They provide practical and material support along with advice on what is available for families raising disabled or seriously ill children and young people..
"We believe that all families raising disabled or seriously ill children and young people should have the same opportunities as others. Beginning with the most vulnerable, those on low incomes, and considering all conditions against our disability criteria, we aim to make a difference to outcomes for disabled or seriously ill children and young people and the lives of the families raising them across the UK. We provide grants for a wide range of items, such as washing machines, sensory toys, family breaks, bedding, tablets, furniture, outdoor play equipment, clothing and computers. It can be a struggle financially, emotionally and physically for families raising a disabled or seriously ill child, and these grants help break down many of the barriers families face, improving their quality of life and easing the additional daily pressures." If you would like to find out more about the support available please visit https://www.familyfund.org.uk/ or contact Salena.Begley@familyfund.org.uk if you would like to get involved to help Family Fund.